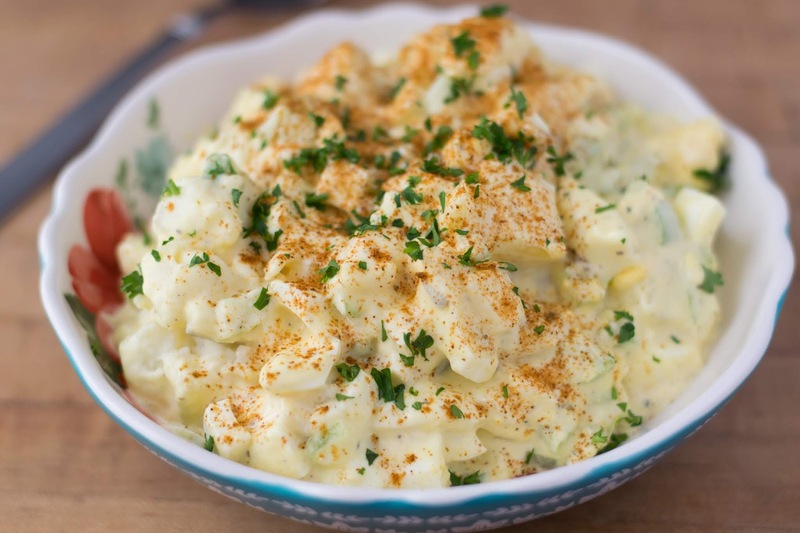 So the other day my friend and fellow food blogger, April, who blogs over at The Tipsy Housewife, were talking about potato salad. She was saying how she was going to put her recipe up on her blog soon (Which I will link her recipe HERE) and I was telling her that I was going to make my Mom's Famous Potato Salad Recipe in my Instant Pot and post it. Long story short, we decided to make a friendly little challenge out of it! 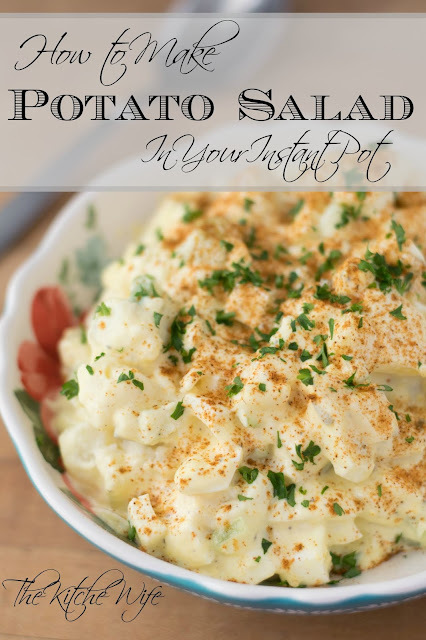 To make this delicious Instant Pot Potato Salad recipe, you're going to need a few simple ingredients. To being you will need to place your diced potatoes into the bottom of your Instant Pot and place the eggs on top. You may be asking yourself "Mandee, do you REALLY need a full dozen of eggs for this?" The answer to that question is, and always will be, YES! The eggs make the potato salad, so go ham on it! Place the lid on your pressure cooker and set the valve to SEALING. Now press the MANUAL button and set the timer to 6 MINUTES. After 6 minutes you will do what is called a quick release by placing the valve to VENTING. As you can see, the potatoes are perfectly cooked as well as the eggs. Using a spoon or a pair of tongs, you will place the eggs into an ice bath. While the eggs are chilling, you will need to drain the potatoes and rinse them with cold water. Place the potatoes, celery, and onion into a large mixing bowl. Now you can peel and chop your eggs. Add them to the bowl as well. I would also like to add that never in my life have I had eggs peel as easily as they did in the Instant Pot. Time to make the dressing! In another mixing bow you will want to combine the mayonnaise, mustard, relish, salt, and pepper. Now, I will add this. My mom uses sugar in her dressing. I replace the sugar with the sweet pickle relish, BUT if you find that the dressing is too tart, add a little sugar to taste. Pour the dressing over the potatoes, eggs, and vegetables. Give everything a good stir, cover with cling wrap, and chill in the refrigerator for at least 2 hours. And there you have it! 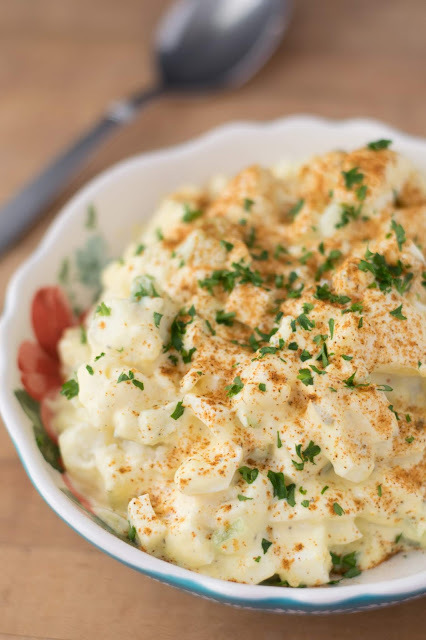 My Mom's Famous Potato Salad Recipe made in the Instant Pot is quite possibly perfection in a bowl and I know it will take any and all of your summer BBQs to the next level! The best part is this was done in about 20 minutes. 20 MINUTES!!!! My mom would have killed for that time line back in the day! 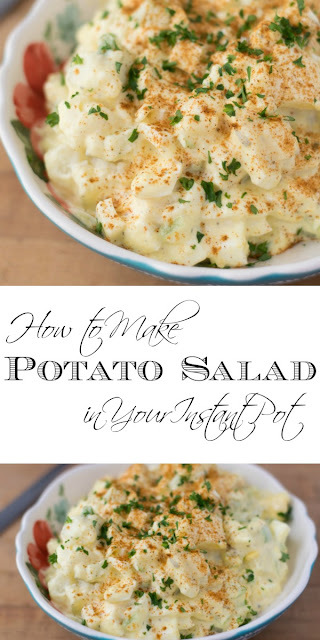 Be sure to check out April's Potato Salad Recipe. I love how she adds apple to hers. And also check out her Instagram because she is one of the most talented cooks I know! Place the peeled and diced potatoes in the bottom of your Instant Pot and place the eggs on top of them. Hit the MANUAL button on the Instant Pot and set the time to 6 Minutes. Allow the Instant Pot to come to pressure and cook for 6 minutes. When finished, turn the valve to VENTING for a quick release. 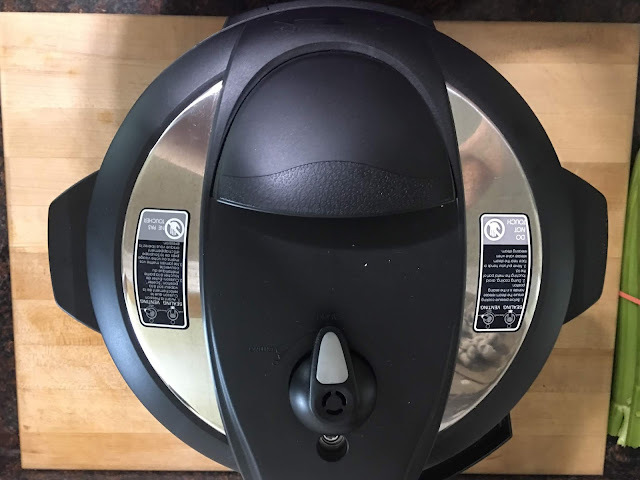 Once the pressure has release you can remove the lid of the pressure cooker and place the eggs into a bowl of ice water to chill. While the eggs are chilling, you will drain the potatoes and rinse with cold water. Place the potatoes, celery, and onion into a mixing bowl. Peel and chop the eggs. Add them to the mixing bowl as well. In a separate mixing bowl, combine the mayonnaise, mustard, relish, salt, pepper, and if you like sugar. Mix together and chill in the refrigerator for at least two hours. I just made a potato salad yesterday and then saw your Insta pot one this morning. It looks wonderful Mandee!!! Got to love a great potato salad. You really, really, do. My mom was like where was this instant pot all those years I spent HOURS making this! LOL Thanks so much for stopping by!